A decade ago, the tennis world seemed about to open up ahead of Kei Nishikori. He had won his first senior title at just 18 in Delray Beach and went on to make the fourth round of his first Major main draw at the US Open the same year. But he would not win another title for over four years, or even reach another final for more than three years. And he would not get beyond the third round at a Major until reaching the quarter-finals of the Australian Open in 2012. For then, as on many occasions since, Nishikori hit the injury buffers. Having been named the 2008 ATP Newcomer of the Year, he withdrew from three Majors in 2009 following elbow surgery. Come 2011, he put together his best season thus far to reach a career-high 25. That went up to 19 in 2012, and he made a huge impact in his home country to become the first Japanese winner of the Tokyo Open. Yet in the midst of this resurgent year, Nishikori still missed the points-rich Madrid, Rome and Roland Garros season with an abdominal injury. In 2014, he ended the season as the highest-ranked Asian in ATP history, finishing at No5 after scoring 54 match-wins, among them his first runner-up finishes at a Masters—Madrid—and a Major—the US Open. In 2016, there were missed tournaments with hip and rib injuries, in what was becoming an all-too-common story, and in 2017, he finally drew a line in his season in August to heal a persistent wrist injury. Little wonder that, by the time he began his comeback—initially on the Challenger circuit—last year, his ranking had slipped to its lowest in six years. This time last year, playing in New York, he was at 27, but slowly and surely, he worked his way back, reached the final of the Monte Carlo Masters via Marin Cilic and Alexander Zverev, beat Grigor Dimitrov in Rome, and made his first Wimbledon quarter-final in July. Back into the semis at the US Open, then the quarters at both the Shanghai and Paris Masters, he qualified for the World Tour Finals for the fourth time in five years—a measure of the resilience of the Japanese player given his catalogue of injury time-outs. His 2019 began with his first title since 2016, in Brisbane, having lost his previous nine finals, and he then survived three five-set matches at the Australian Open en route to the quarters, before being forced to retire against Novak Djokovic with a quad strain. However, such has been his rise to the elite level over the last 12 months that Nishikori arrives in Rotterdam as the top seed, ranked No7, and the man to beat for the prestigious title. But after so many withdrawals from the Rotterdam draw—Zverev, Cilic, Lucas Pouille, Roberto Bautista Agut, Dimitrov, and more—it was important to clarify Nishikori’s shape ahead of his opening match. Nishikori is a quiet man of few words, so he was clearly a little non-plussed when asked what his Dutch coach had told him about the Netherlands ahead of his first visit. He was not wrong: Since his arrival ahead of the weekend, it had rained almost incessantly, and the winds were so strong that flights were delayed at Schipol. To the locals, 5C is not a problem, but to a man coming straight from training in Florida, yes, more of a problem. So why had he chosen to come here for the first time? Indeed, among those who will contest the title are four previous champions, three of them former top-five players, plus five more top-20 players. And Nishikori happens to be drawn against the runner-up in Montpellier just yesterday, No36 Pierre-Hugues Herbert. But he has avoided the most dangerous seeds and former champions: He cannot meet Stan Wawrinka, Tomas Berdych, Jo-Wilfied Tsonga or dangerous #NextGen players Stefanos Tsitsipas, Denis Shapovalov and Karen Khachanov until at least the semi-finals. What else had brought Nishikori here, though? 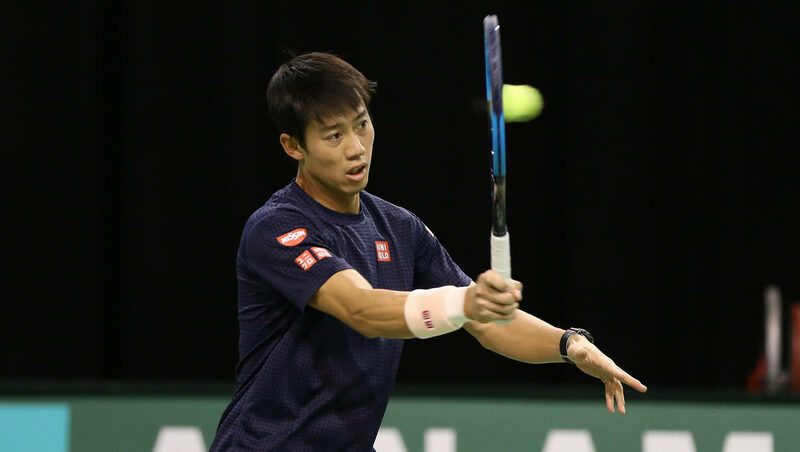 It was, perhaps, another blow for the Japanese player when the tour pulled Memphis from the calendar last year: Nishikori had won the indoor tournament there four years in a row, from 2013 to 2016. However, he has looked in good spirits since arriving in Europe’s ‘windy city’, though perhaps not surprisingly, he is wearing plenty of layers. Nishikori begins his campaign at 7.30pm Tuesday, and will be followed by Khachanov. The day session, beginning at 11am, features No4 seed Milos Raonic, No10 seed Shapovalov, and No8 seed David Goffin.